a) Good thing the school levy passed! b) It's true what they say: Ashland really is "someplace 'special'"
Or come up with your own! What does excellent (or "excellentt") mean in context? Was this a state designation of the ranking of that school? 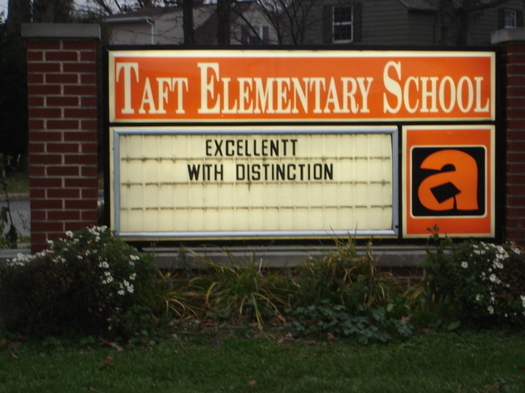 Standards are so low for public education across the state, we could be grateful for the slight mispelling; at least we can tell what was intended. I was at a meeting about public education last week. It was educational, although nothing in it was unexpected news. For example, Ohio has what are called OGT's: Ohio Graduation Tests. Everyone must pass the test to graduate from high school. However, statewide, 42% of Ohio high school graduates entering college must take remedial classes in either math or English. That's appalling. At least locally we must be better, said one person from the auduence. Our local high school has an excellent state ranking. Well, actually, 43% of our high school graduates need remediation. "At least we are in the ballpark." said the speaker. It is one heck of a ballpark. What is excellence in education for our state? My caption for your photo? Abandon hope all ye who enter here. Blushing for my own misspellings. I forgot to read that through before posting. When my children were in elementary school (many years ago) my wife wanted them to go to private school. I, having has a superb education in public schools, demurred. The teacher sent home a note that said that my son was boisterous and disruptive. I said: Yep, that's my boy. But she misspelled both boisterous and disruptive. Private school it was. d). Why I home school my son. In the stupid state, California, over 49% of high school graduates entering JUNIOR college must take remedial classes. My daughter wrote me a nice note thanking me for chaperoning a field trip taken by her class to the county fair. It was well written and, uncharacteristically, there were no spelling errors. It w accompanied by a note from her English teacher asking me to "bare with" her because she had not had the time to proofread or correct the notes from the children. All I could think was, "Thank goodness!" I mean, I barely know the woman and, anyway, I'm not that kind of girl. Julie, how wonderfully funny and ironic! D. Huh. Looks like cowgirl's been here. Happy Thanksgiving Scanlon. Taking time off from OWS I see!! Good for you. You need some rest. one of the biggest tragedies of our youth today is the unearned self-esteem foisted upon them by teacher, parents or society. Everyone agrees the United States needs to improve its education system dramatically, but how? One of the hottest trends in education reform lately is looking at the stunning success of the West's reigning education superpower, Finland. Trouble is, when it comes to the lessons that Finnish schools have to offer, most of the discussion seems to be missing the point. The small Nordic country of Finland used to be known -- if it was known for anything at all -- as the home of Nokia, the mobile phone giant. But lately Finland has been attracting attention on global surveys of quality of life -- Newsweek ranked it number one last year -- and Finland's national education system has been receiving particular praise, because in recent years Finnish students have been turning in some of the highest test scores in the world. Finland's schools owe their newfound fame primarily to one study: the PISA survey, conducted every three years by the Organization for Economic Co-operation and Development (OECD). The survey compares 15-year-olds in different countries in reading, math, and science. Finland has ranked at or near the top in all three competencies on every survey since 2000, neck and neck with superachievers such as South Korea and Singapore. In the most recent survey in 2009 Finland slipped slightly, with students in Shanghai, China, taking the best scores, but the Finns are still near the very top. Throughout the same period, the PISA performance of the United States has been middling, at best. Compared with the stereotype of the East Asian model -- long hours of exhaustive cramming and rote memorization -- Finland's success is especially intriguing because Finnish schools assign less homework and engage children in more creative play. During the afternoon that Sahlberg spent at the Dwight School, a photographer from the New York Times jockeyed for position with Dan Rather's TV crew as Sahlberg participated in a roundtable chat with students. The subsequent article in the Times about the event would focus on Finland as an "intriguing school-reform model." Yet one of the most significant things Sahlberg said passed practically unnoticed. "Oh," he mentioned at one point, "and there are no private schools in Finland." This notion may seem difficult for an American to digest, but it's true. Only a small number of independent schools exist in Finland, and even they are all publicly financed. None is allowed to charge tuition fees. There are no private universities, either. This means that practically every person in Finland attends public school, whether for pre-K or a Ph.D.